The game season is finished now, but I happen to have a small supply of pheasant breasts in the freezer. I like pheasant but it has one drawback; it’s easy to overcook and can be quite dry if you’re not careful. To counteract this tendency to dryness I cooked them carefully in butter at a fairly low temperature, almost like a confit, and served them with a generous amount of bright yellow rapeseed dressing which is pretty much just a light mayonnaise. As is always the case in my kitchen, I had a pile of sourdough bread scraps to use up. They were crying out to me made into croutons and this provided the perfect addition to the dish, bringing a vital texture contrast. Cutting the still-warm pheasant into chunky dice, with a little pinkness showing, and the croutons cut the same size, I was happy with the result. Firstly, cook the pheasant breasts. Place the butter In a wide heavy-based pan and place over a medium-low heat . Season the pheasant breasts all over with salt and pepper then place in the pan. Cook on a low heat, without letting the butter sizzle, for around 15 minutes, turning every 3 minutes or so, or basting the breasts with the butter. Cook until they’re slightly pink in the middle (60C), then remove from the pan and allow to cool. You can reserve the butter for use in another recipe. Cut the sourdough into approx. half-inch cubes. In another pan, heat 3 tablespoons of vegetable oil and place over a medium heat. When the oil is hot, add the sourdough cubes and stir to coat evenly in the oil. Add a pinch of salt and pepper, then stir and fry the croutons until they’re golden and crisp. Remove with a slotted spoon and leave in a colander or sieve to drain. For the dressing, place the egg yolk, vinegar, Dijon mustard and a pinch of salt in a bowl. Whisk until combined, then begin to add the rapeseed oil, a little at a time, while whisking continuously. Once all the oil is combined you should have a thick, mayonnaise-like consistency. Add some water to thin it out a bit, and adjust the seasoning with salt if needed. 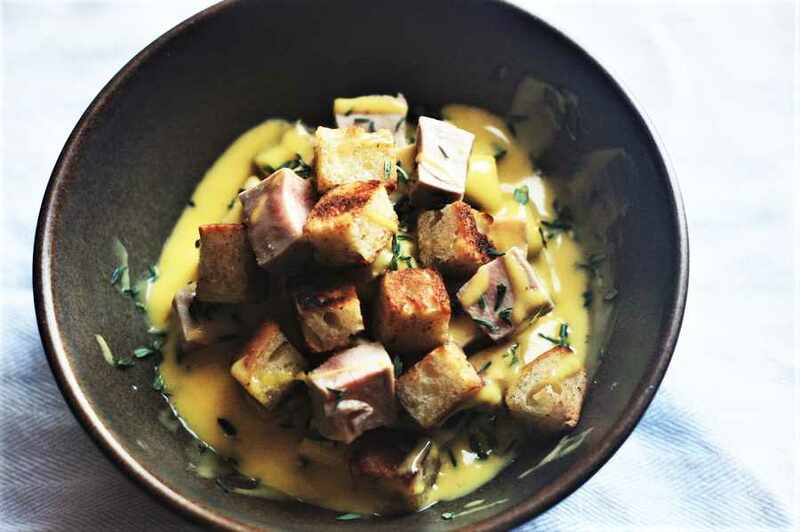 Cut the pheasant breasts into the same size cubes as the croutons. Mix everything together, leaving a few cubes with nice pinkness showing for display on the top. Finally sprinkle over some thyme leaves for garnish.